Theme parties, I love them. If I am planning a party that’s nice. But if I can come up with a theme for the party. Now that’s a whole different thing, another level of a fun. I immediately get excited. I throw myself into it with gusto. I get caught up incorporating the theme into as many details as I can, the more details the better. That’s the fun, it’s like a giant scavenger hunt, what will you find? A little obsessive I think. 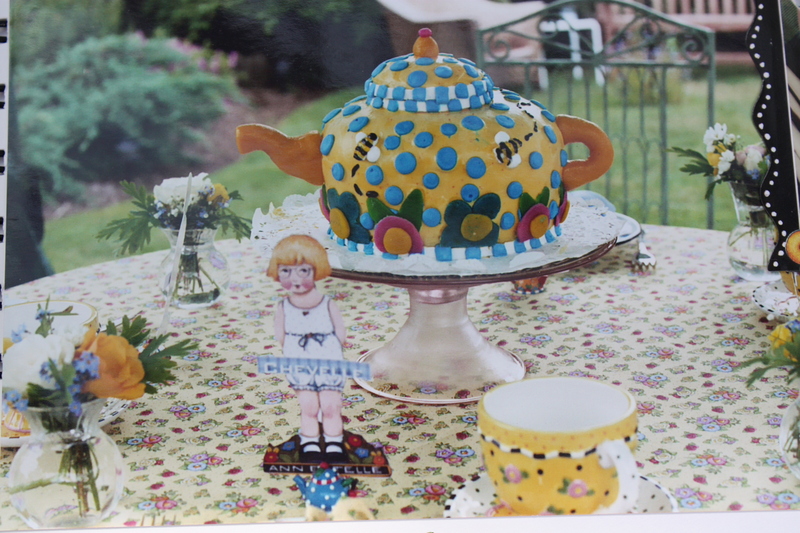 You may wonder what do themed parties have to do with art quilting, after all, this is a blog about fiber art, isn’t it? I think the common thread is imagination and creativity, they are really little ideas we have that excite us. I threw a baby shower for my middle son’s first baby. It was such an exciting occasion that I got into theme party overdrive mode. He loves the Japanese culture. My daughter in Law has an older brother who lived in Japan for many years, married, had children who were just hitting their teens when they moved back to the states. I thought what a great idea for the shower, a Japanese theme. This was to have 50 or 60 people attending. I was off and running looking for anything I could use that fit the theme. but found it was hard to find decorations, baby themed Japanese items that were specific only to Japan. So in the end it became an Asian theme, with emphasis on Japan. I had 3 lovely cooperative granddaughters who agreed to be the hostesses welcoming the guestsparties and ar, creativity,, color, me,I’ll get to that. I get overly excited and go extremely over the top behavior, yes? It is much more fun. I threw a baby shower for my middle son’s first baby. It was such an exciting occasion that I got into theme party overdrive mode. He loves the Japanese culture. My daughter in Law has an older brother who lived in Japan for many years, married, had children who were just hitting their teens when they moved back to the states. I thought what a great idea for the shower, a Japanese theme. This was to have 50 or 60 people attending. I was off and running looking for anything I could use that fit the theme. but found it was hard to find decorations, baby themed Japanese items that were specific only to Japan. So in the end it became an Asian theme, with emphasis on Japan. I had 3 lovely cooperative granddaughters who agreed to be the hostesses welcoming the guestsparties and ar, creativity,, color, me,I’ll get to that. I get overly excited and go extremely over the top behavior, yes? It is much more fun. I threw a baby shower for my middle son’s first baby. It was such an exciting occasion that I got into theme party overdrive mode. He loves the Japanese culture. My daughter in Law has an older brother who lived in Japan for many years, married, had children who were just hitting their teens when they moved back to the states. I thought what a great idea for the shower, a Japanese theme. This was to have 50 or 60 people attending. I was off and running looking for anything I could use that fit the theme. but found it was hard to find decorations, baby themed Japanese items that were specific only to Japan. So in the end it became an Asian theme, with emphasis on Japan. I had 3 lovely cooperative granddaughters who agreed to be the hostesses welcoming the gueststheme party overdrive mode. He loves the Japanese culture. My daughter in Law has an older brother who lived in Japan for many years, married, had children who were just hitting their teens when they moved back to the states. I thought what a great idea for the shower, a Japanese theme. This was to have 50 or 60 people attending. I was off and running looking for anything I could use that fit the theme. but found it was hard to find decorations, baby themed Japanese items that were specific only to Japan. So in the end it became an Asian theme, with emphasis on Japan. I had 3 lovely cooperative granddaughters who agreed to be the hostesses welcoming the guestsbut found it was hard to find decorations, baby themed Japanese items that were specific only to Japan. So in the end it became an Asian theme, with emphasis on Japan. I had 3 lovely cooperative granddaughters who agreed to be the hostesses welcoming the guests With parties and everything else, I suppose, once I get an idea my excitement levels shoot through the roof. On the other hand, if I’m not moved, excited or intrigued it simply has no appeal for me. I have to have my heart into it, and when I do I will pursue it down to the last tiny detail..if I’m engaged I go all out. I get overly excited and go extremely over the top behavio.. Every detail is important and I’m the happiest if I can follow my theme right down to thw smallest detailr, yes? It is much more fun. I threw a baby shower for my middle son’s first baby. It was such an exciting occasion that I got into theme party overdrive mode. He loves the Japanese culture. My daughter in Law has an older brother who lived in Japan for many years, married, had children who were just hitting their teens when they moved back to the states. I thought what a great idea for the shower, a Japanese theme. This was to have 50 or 60 people attending. I was off and running looking for anything I could use that fit the theme. but found it was hard to find decorations, baby themed Japanese items that were specific only to Japan. So in the end it became an Asian theme, with emphasis on Japan. I had 3 lovely cooperative granddaughters who agreed to be the hostesses welcoming the guestsget an idea my excitement levels shoot through the roof. On the other hand, if I’m not moved, excited or intrigued it simply has no appeal for me. I have to have my heart into it, and when I do I will pursue it down to the last tiny detail..if I’m engaged I go all out. I get overly excited and go extremely over the top behavio.. Every detail is important and I’m the happiest if I can follow my theme right down to thw smallest detailr, yes? It is much more fun. I threw a baby shower for my middle son’s first baby. It was such an exciting occasion that I got into theme party overdrive mode. He loves the Japanese culture. My daughter in Law has an older brother who lived in Japan for many years, married, had children who were just hitting their teens when they moved back to the states. I thought what a great idea for the shower, a Japanese theme. This was to have 50 or 60 people attending. I was off and running looking for anything I could use that fit the theme. but found it was hard to find decorations, baby themed Japanese items that were specific only to Japan. So in the end it became an Asian theme, with emphasis on Japan. I had 3 lovely cooperative granddaughters who agreed to be the hostesses welcoming the guestsget an idea my excitement levels shoot through the roof. On the other hand, if I’m not moved, excited or intrigued it simply has no appeal for me. I have to have my heart into it, and when I do I will pursue it down to the last tiny detail..if I’m engaged I go all out. I get overly excited and go extremely over the top do I will pursue it down to the last tiny detail..if I’m engaged I go all out. I get overly excited and go extremely over the top behavio.. Every detail is important and I’m the happiest if I can follow my theme right down to thw smallest detailr, yes? It is much more fun. I threw a baby shower for my middle son’s first baby. It was such an exciting occasion that I got into thw smallest detailr, yes? It is much more fun. I threw a baby shower for my middle son’s first baby. It was such an exciting occasion that I got into thw smallest detailr, yes? It is much more fun. I threw a baby shower for my middle son’s first baby. It was such an exciting occasion that I got into theme party overdrive mode. He loves the Japanese culture. My daughter in Law has an older brother who lived in Japan for many years, married, had children who were just hitting their teens when they moved back to the states. I thought what a great idea for the shower, a Japanese theme. This was to have 50 or 60 people attending. I was off and running looking for anything I could use that fit the theme. but found it was hard to find decorations, baby themed Japanese items that were specific only to Japan. So in the end it became an Asian theme, with emphasis on Japan. I had 3 lovely cooperative granddaughters who agreed to be the hostesses welcoming the guestsbut found it was hard to find decorations, baby themed Japanese items that were specific only to Japan. So in the end it became an Asian theme, with emphasis on Japan. I had 3 lovely cooperative granddaughters who agreed to be the hostesses welcoming the guestsbut found it was hard to find decorations, baby themed Japanese items that were specific only to Japan. So in the end it became an Asian theme, with emphasis on Japan. I had 3 lovely cooperative granddaughters who agreed to be the hostesses welcoming the guests t is much more fun. I threw a baby shower for my middle son’s first baby. It was such an exciting occasion that I got into theme party overdrive mode. He loves the Japanese culture. My daughter in Law has an older brother who lived in Japan for many years, married, had children who were just hitting their teens when they moved back to the states. I thought what a great idea for the shower, a Japanese theme. This was to have 50 or 60 people attending. I was off and running looking for anything I could use that fit the theme. but found it was hard to find decorations, baby themed Japanese items that were specific only to Japan. So in the end it became an Asian theme, with emphasis on Japan. I had 3 lovely cooperative granddaughters who agreed to be the hostesses welcoming the guests in in Kimonos. I I ordered 2 lightweight summer kimonos, though that is not the proper name for these, I also had a gorgeous vintage garment that looked Chinese, a brocade like fabric that looked like spun gold. For the 2 younger girls, I made Obi’s and learned how to wrap them around their waists and tie the large bow s that tied in the back. You can learn anything from U-Tube. I found the white socks with the toes, the name escapes me. They were to greet the guests with “Konnichiwa” a welcome greeting. For over a month I searched eBay for Kokeshi dolls, trays, fans, vases and assorted items to be placed in as center groupings on the many tables. Since I couldn’t think of a cuddly animal associated with Japan specificity. like a teddy bear, I went for Pandas, although Chinese. I made a panda cake, Wilton has a large sitting teddy bear cake pan that can be decorated to look like a panda bear. And naturally more pandas were needed. So I searched the internet for every stuffed panda bear in the country. I found about 20 that I approved, although “used” they weren’t. They looked adorable sitting here and there around the room. Do you get the sense of how obsessed I become with themes? But it was the funnest party ever and I think my 2 soon to be parents were surprised,and that made it worth any effort.but found it was hard to find decorations, baby themed Japanese items that were specific only to Japan. So in the end it became an Asian theme, with emphasis on Japan. I had 3 lovely cooperative granddaughters who agreed to be the hostesses welcoming the guests in in Kimonos. I I ordered 2 lightweight summer kimonos, though that is not the proper name for these, I also had a gorgeous vintage garment that looked Chinese, a brocade like fabric that looked like spun gold. For the 2 younger girls, I made Obi’s and learned how to wrap them around their waists and tie the large bow s that tied in the back. You can learn anything from U-Tube. I found the white socks with the toes, the name escapes me. They were to greet the guests with “Konnichiwa” a welcome greeting. For over a month I searched eBay for Kokeshi dolls, trays, fans, vases and assorted items to be placed in as center groupings on the many tables. Since I couldn’t think of a cuddly animal associated with Japan specificity. like a teddy bear, I went for Pandas, although Chinese. I made a panda cake, Wilton has a large sitting teddy bear cake pan that can be decorated to look like a panda bear. And naturally more pandas were needed. So I searched the internet for every stuffed panda bear in the country. I found about 20 that I approved, although “used” they weren’t. They looked adorable sitting here and there around the room. Do you get the sense of how obsessed I become with themes? But it was the funnest party ever and I think my 2 soon to be parents were surprised,and that made it worth any effort.but found it was hard to find decorations, baby themed Japanese items that were specific only to Japan. So in the end it became an Asian theme, with emphasis on Japan. I had 3 lovely cooperative granddaughters who agreed to be the hostesses welcoming the guests in in Kimonos. I I ordered 2 lightweight summer kimonos, though that is not the proper name for these, I also had a gorgeous vintage garment that looked Chinese, a brocade like fabric that looked like spun gold. For the 2 younger girls, I made Obi’s and learned how to wrap them around their waists and tie the large bow s that tied in the back. You can learn anything from U-Tube. I found the white socks with the toes, the name escapes me. They were to greet the guests with “Konnichiwa” a welcome greeting. For over a month I searched eBay for Kokeshi dolls, trays, fans, vases and assorted items to be placed in as center groupings on the many tables. Since I couldn’t think of a cuddly animal associated with Japan specificity. like a teddy bear, I went for Pandas, although Chinese. I made a panda cake, Wilton has a large sitting teddy bear cake pan that can be decorated to look like a panda bear. And naturally more pandas were needed. So I searched the internet for every stuffed panda bear in the country. I found about 20 that I approved, although “used” they weren’t. They looked adorable sitting here and there around the room. Do you get the sense of how obsessed I become with themes? But it was the funnest party ever and I think my 2 soon to be parents were surprised,and that made it worth any effort.bow s that tied in the back. You can learn anything from U-Tube. I found the white socks with the toes, the name escapes me. They were to greet the guests with “Konnichiwa” a welcome greeting. For over a month I searched eBay for Kokeshi dolls, trays, fans, vases and assorted items to be placed in as center groupings on the many tables. Since I couldn’t think of a cuddly animal associated with Japan specificity. like a teddy bear, I went for Pandas, although Chinese. I made a panda cake, Wilton has a large sitting teddy bear cake pan that can be decorated to look like a panda bear. And naturally more pandas were needed. So I searched the internet for every stuffed panda bear in the country. I found about 20 that I approved, although “used” they weren’t. They looked adorable sitting here and there around the room. Do you get the sense of how obsessed I become with themes? But it was the funnest party ever and I think my 2 soon to be parents were surprised,and that made it worth any effort.like a teddy bear, I went for Pandas, although Chinese. I made a panda cake, Wilton has a large sitting teddy bear cake pan that can be decorated to look like a panda bear. And naturally more pandas were needed. So I searched the internet for every stuffed panda bear in the country. I found about 20 that I approved, although “used” they weren’t. They looked adorable sitting here and there around the room. Do you get the sense of how obsessed I become with themes? But it was the funnest party ever and I think my 2 soon to be parents were surprised,and that made it worth any effort.funnest party ever and I think my 2 soon to be parents were surprised,and that made it worth any effort. Mary Engelbreit table setting, I made the tablecloth and napkins. 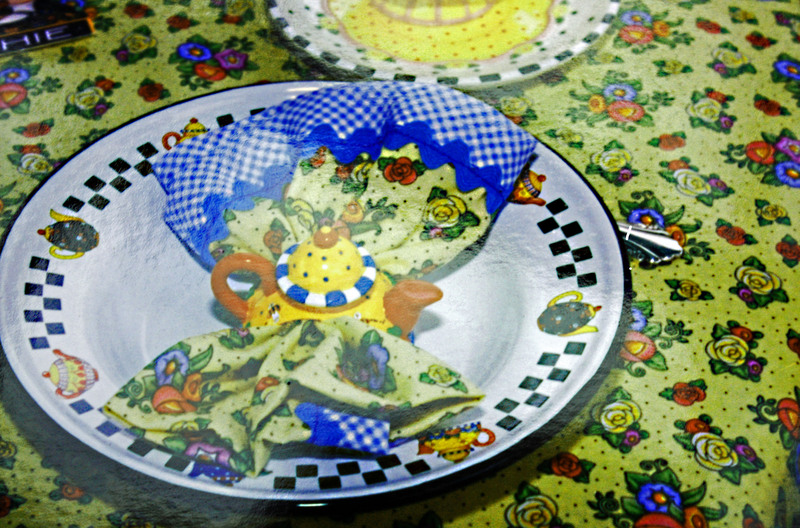 The napkin holders are Mary E. napkin holders with a teapot cake. Never know when enough is enough.Mary Englibret napkin holder with a teapot cake. Never know when enough is enough.